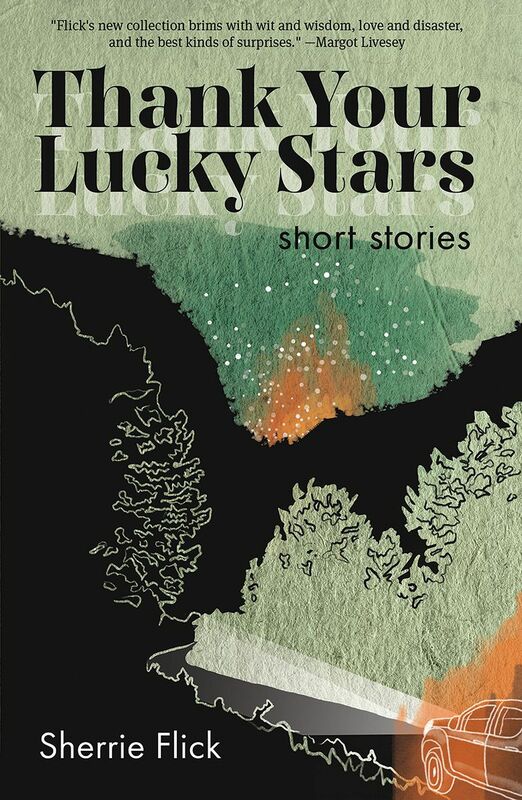 The 50 stories in Thank Your Lucky Stars were written over the same time period that the author worked on her first short story collection, Whiskey, Etc. Flick says she likes to think of this collection as the darker, edgier “B-side” of Whiskey, Etc. The book is a mix of both flash fiction and longer short stories. Butch curled himself closer, drawing her long legs through his, tangling their lives like two floating fishnets. He ran his hand through her long hair while he told her stories. Stories about moons rising, like the one outside her bedroom window, rising slowly like a dandelion ready to blow away and leave the night pitch-black and lonely—moons waiting for lovers like themselves to make the darkness into something more. The characters in Thank Your Lucky Stars are often at one crossroads or another—especially when it comes to navigating relationships—whether it be a breakup, falling in love, or getting busted for infidelity—which are embodied in details like faux farmers in “How I Left Ned,” or a purring cat in “And Then,” or a cashmere sock in “Sweetie Pie.” Flick has a penchant for creating memorable details. One story features a mounted deer head named Mr. Bojangles. In another story, a cowboy photographer goes door to door on a pony named Puff. In “Lenny the Suit Man” a tailor fits men for suits out of his van, which also has an espresso machine bolted inside. In Wyoming, baby cows are born with fluffy white clouds for faces. Birds fall fast and furious from the sky. They don’t get hurt. It’s all an act, like Houdini, a sleight of hand. Just like the hills that converge and rise, roll and fall, and creep around at night like cups in a guessing game. In the morning you swear that one of the hills used to be over there, not here.